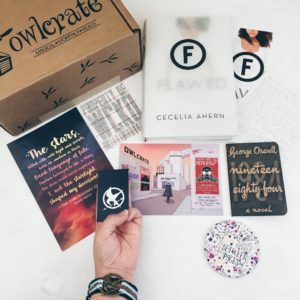 Owlcrate’s April theme was Dystopia and they really nailed it – I especially appreciate the inclusion of the Shatter Me coaster, as that is a series that doesn’t get as much attention as the others! I love stickers and decals that I can adorn my various laptops with. As a die hard Hunger Games fan I almost squealed when I opened the box and took out not only a bracelet, but a magnet too! They are, by far, my favorite things from this box. I love the layered look of the bracelet and the simplicity of the magnet is perfect. I was also really happy to see the inclusion of @eviebookish’s coaster – it is always wonderful to see the #bookstagram community get represented in things like Owlcrate! If you haven’t visited her, I urge you to – her designs are amazing. They’re always so bright and colorful and I love them. If you liked the design on the coaster in this month’s Owlcrate you should check out Evie’s society6 and Redbubble stores. You can find the link to her store on her instagram. As much as I love books, I have an obsession for notebooks as well. I need as many notebooks as I can get since I’ve been writing down all the books I’ve been reading this year. I’ve also been writing down any thoughts I have while reading a book as it helps me when I go to write a review. Hopefully, I’ll be able to get around to reading Flawed and writing a review for it. Visit Owlcrate if you’re interested in a subscription!